Anyone can purchase Harley-Davidson industry reports which discuss motorcycle demand and forecasts. Topics often include market size, product segmentation, technology trends, environmental and regulatory factors, trade, market environment, product forecasts and the like. Or you can wait and watch your inbox as the news or sales promotions roll in for an indicator on the state of the state. 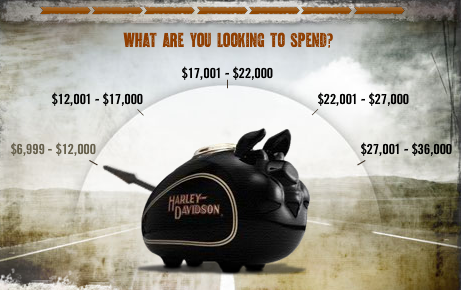 Statistically motorcycle sales are way off. Tell me something we don’t already know! Yet adding to this drum beat was the announcement and regulatory filing from Harley last week that worldwide sales by its dealers fell 13% in the first two months of the year, a clear sign that the recession continues. In the U.S., which represent nearly two-thirds of the company’s business, sales were down 9.4% and international sales were down 21.5% compared with 2008. All this after the “We Ride Free” campaign where its message is: trade up! 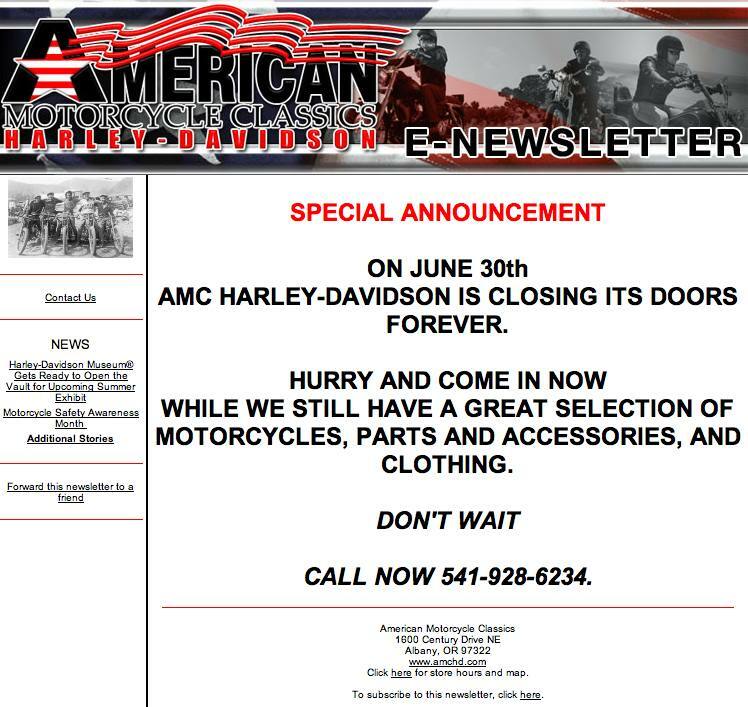 The latest Harley deal to arrive in my inbox was from American Motorcycle Classics (Albany, Or.). It’s a $3679.00 discount on a 2009 FXDFSE CVO Dyna Fat Bob. Does that pull on your heart-wallet string? I’m not so sure! Because $22K is still a lot of coin in this time when so many are in dire need of cash. The 90% of the population who are employed and can afford it know the value of money in these dicey times and those who don’t are unlikely to qualify for a loan. Maybe Harley-Davidson should consider the possibility of selling off some of their brands? The Buell and MV Agusta Group would be likely candidates for the “selling block” and might help restore the company or remove massive debt loads? Just a short seven months ago Harley paid $109 Million for the Italian motorcycle maker to increase its presence in Europe. This was somewhat logical back when stock was in the mid-$40’s and sales in the European market were increasing 16%-20% every quarter, but clearly HOG shareholders would like a “do-over” as sales are in the tank and the stock has now closed below $8 a share! It’s interesting that Harley exec’s got this deal through the board at a time when Harley’s 2008 sales were down more than 7% and after a 5.3% drop in 2007. Now the trouble is, does anyone have interest in Harley – or the equity – to make a deal? That doesn’t bode well for the company unless they are looking at efforts to turn themselves around with the help of taxpayer cash? Think about it: well-financed Asian motorcycle companies like Honda (NYSE: HMC) or Tata Motors Ltd. (NYSE: TTM) could pull the Harley nameplates off the scrap heap for next to nothing — without having to take on burdens like massive debt loads or union pension obligations. But even they are not willing to because they don’t think they can make money with it. Yet, somehow we’re supposed to look the other way after reviewing Harley’s dreadful balance sheet and debt situation and continue to believe those same managerial geniuses will turn around the brands without shedding their massive debt obligations? It just doesn’t make any sense at all. Disclosure: Author has no ownership in HOG.